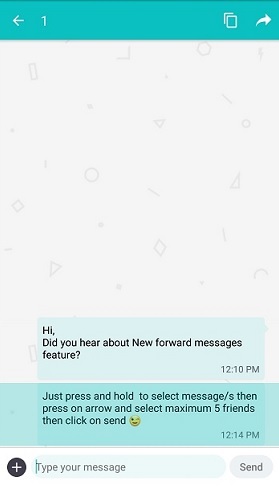 How Do I Forward a message in conversation? – Welcome to the Baaz Suggestion Box! 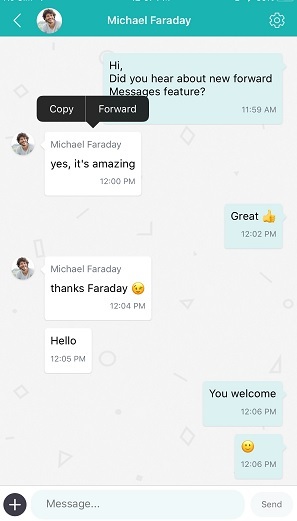 - You are able to forward up to 5 Messages per personal conversation or Group conversation at each time. - You are unable to Forward more than 5 messages at the same time to other persons. 2. Select on the conversation that you want to forward there message and click on the Tap bottom of the message. 3. Tap on Forward message. 4. Select the friends who want to forward your message by check bottom. 3. Hold press on selected message, then click on forward bottom at top right corner. 4. Select the friends who you want to forward your message, then click send at top right corner. 3. Hold press on selected message, then click on forward at Down right corner of screen. 4.Select the friends who you want to forward your message, then click send at down right corner.